I hope that you are all having an awesome Holiday weekend! Best case scenario you are with people you love (or at least like!) and are enjoying the weather and having a wonderful Memorial Day. I could not be more excited to share this recipe with you today! Whether you need a last minute dish to make for today’s barbeque, or you want a healthy dinner or just an amazing salad- THIS IS IT!! The salad itself is made with a great mix of romaine hearts and hearty Tuscan kale- both of which I shredded pretty finely. I made the croutons with a gluten free vegan baguette (YUM!!) and the dressing was made with a surprising tahini base- all together it is truly awesome. A vegan option is to sprinkle nutritional yeast in place of cheese over the top of the salad, but I opted for an “everything seed blend” (that is also in the book and consists of sunflowers seeds, sesame and poppy seeds, dried minced garlic and onions and kosher salt) which I sprinkled over the salad and it was a GREAT call, if I do say so myself! If you are too lazy to make it yourself, Trader Joes has a short cut version! To make the croutons: Preheat the oven to 400 degrees. Place the cubed bread on the sheet pan and toss with the olive oil and sprinkle with kosher salt. Bake until golden brown, 7-9 minutes and then set aside. 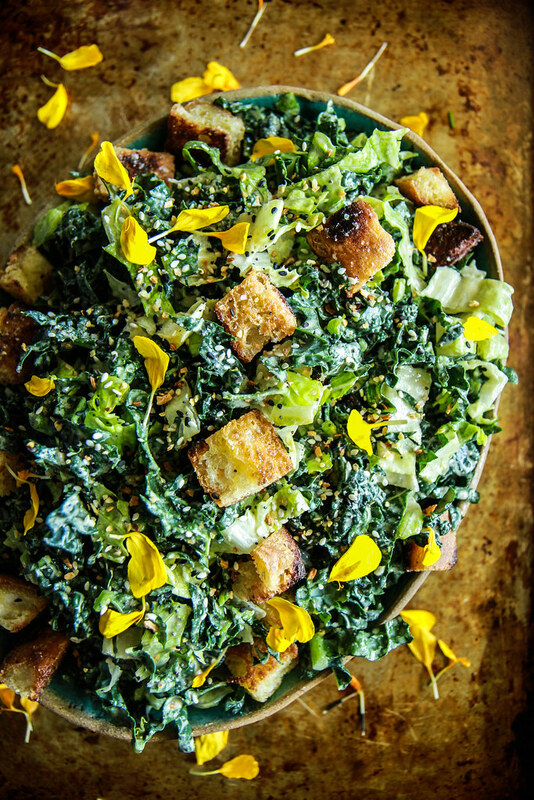 To make the dressing: In a small bowl, whisk together the tahini, lemon, oil, garlic, and mustard. Whisk until smooth and then whisk in water until smooth again and season to taste with kosher salt. 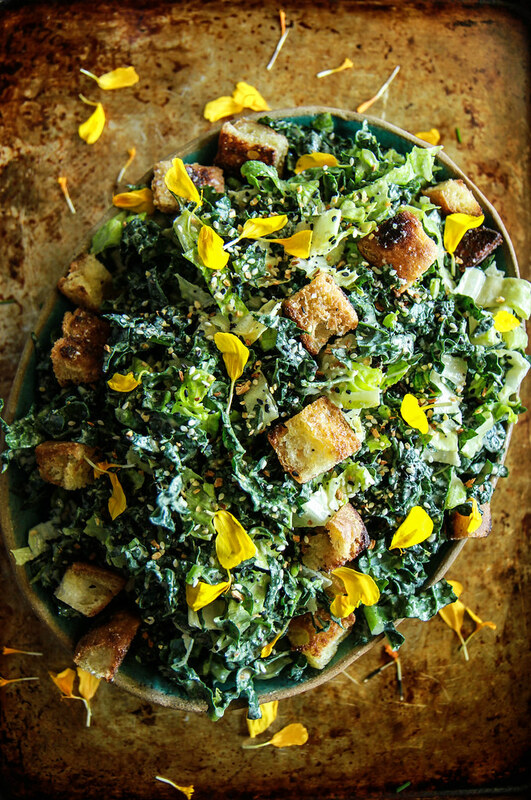 The dressing should be tangy like Caesar salad and the same consistency. To prepare the salad: Transfer the lettuce to a salad bowl and add the dressing and toss to coat the salad. Add the croutons and sprinkle the salad with the “everything seed mix” if using and then serve and enjoy!! A beautiful and tasty salad for summer! Heather, I’m not sure where to get a vegan gluten free baguette. I live in Georgia. Is there an online source for food such as this? I will look into it Brandie! Do you guys have a whole foods nearby? I use Olivia Brand which they carry in the freezer section?